You’ve walked in the front door to find bloody pawprints leading down the hall. What do you do? You’ve taken pooch out for what you thought would be a calm and relaxing walk only to run into a vicious dog. What do you do? Your cat’s had a run in with a snake on the lawn. What do you do? Just like humans, pets can suffer injuries anytime and anywhere and just as you may rely on a friend to bandage your wound, your pet relies on you. Could you handle it if something went wrong or would you let them down? How you act in the immediate moments following an accident can mean the difference between life and death, so are you prepared? As a pet owner, it’s your responsibility to ensure you are well-equipped when accidents strike. This means enrolling yourself in a pet first aid course, such as those offered by the Pet Industry Association (PIA) and building yourself a customised first aid kit. While it is always recommended that your pet visits your vet following an accident, there are a number of ways you can assist your injured pet before transporting them. To do this, you will need a first aid kit. First aid kits may be purchased from the Animal Welfare League, with each kit containing 30 specialty pieces for quick and easy first aid administration. You can also find basic first aid kits in most pet supply stores. Alternatively you could build your own. There is no one-size-fits-all approach to pet first aid kits, so talk to your veterinarian about what you should have in yours. Having a first aid kit that has been customised to suit your pet is the best way in which to ensure you are well prepared in an emergency. 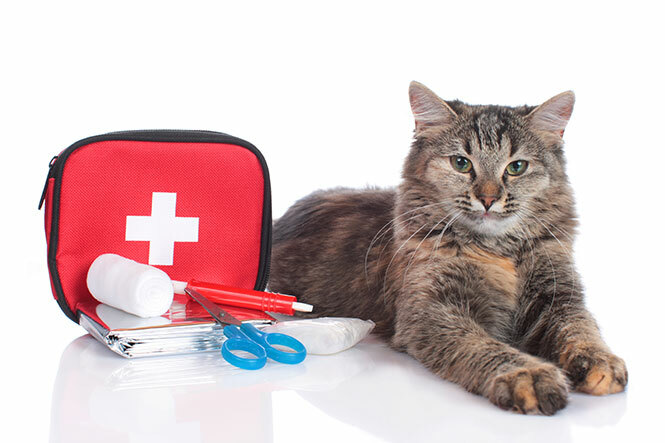 Different species, age groups, and pet lifestyles have different first aid kit needs. Pets who take medication regularly should have a couple of days supply of all current medications (be sure to rotate so they don’t expire). Note: It is easy to forget first aid training when faced with an emergency, especially when it involves your best friend, therefore it is recommended that you download VetWest’s FREE First Aid for Pets app on your phone to complement your customised first aid kit. Written by Australian vets to provide both accuracy and relevance it will help you when you need it most. You’ll find 130 helpful and potentially life-saving articles for quick reference in the event of an emergency or potential health risk. Download it today.